Stanley Yacht Services: Charter M/Y Freedom For SunFest 2013! 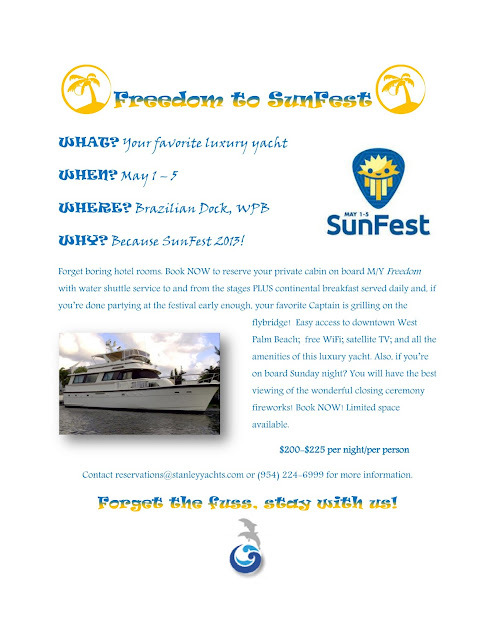 Charter M/Y Freedom For SunFest 2013! One of the biggest and best waterfront music festivals will be kicking off again on May 1. And we'll be there for all the fun! Join us! Forget boring hotel rooms. Book NOW to reserve your private cabin on board M/Y Freedom with water shuttle service to and from SunFest PLUS continental breakfast served daily and, if you’re done partying at the festival early enough, your favorite Captain is grilling on the flybridge! Easy access to downtown West Palm Beach; free WiFi; satellite TV; and all the amenities of this luxury yacht. Also, if you’re on board Sunday night? You will have the best viewing of the wonderful closing ceremony fireworks! Book NOW! Limited space available. Contact reservations@stanleyyachts.com or (954) 224-6999 for more information.